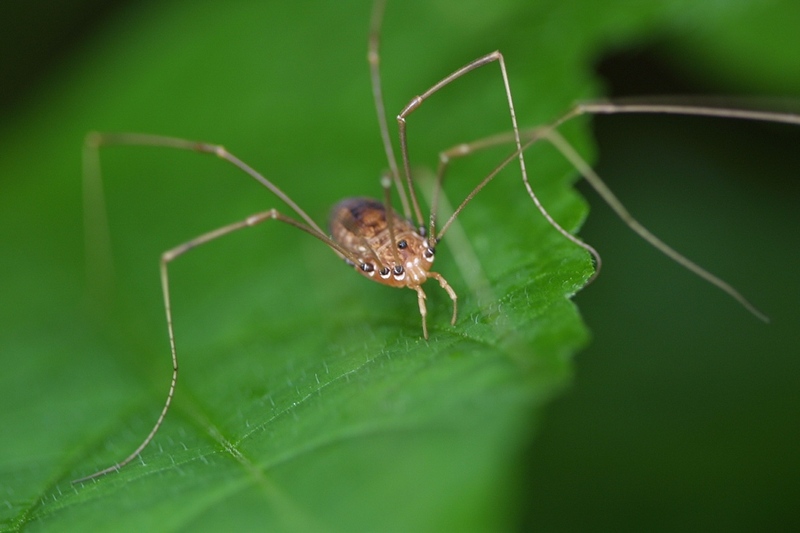 Myth: Daddy Long Legs are the most poisonous spider in the world. Daddy Long Legs are not the most poisonous spider as you’ll often hear people say. We’ll just ignore the fact that there’s a big difference between “poisonous” and “venomous”, which makes the previous sentence even more ridiculous and assume people mean “venomous” when they make that statement. We’ll also ignore the fact that one of the two arachnids commonly called “Daddy Long Legs” isn’t even a spider. “Daddy Long Legs” is the name of two distinct kinds of creatures, an arachnid and spider of the family Pholcidae and an arachnid in the family Phalangiidae, namely Opiliones (which is the one that’s not a spider). The former of which does have venom, but there is no scientific basis of the idea that it is particularly harmful to humans, and the latter of which has no venom glands or other way to chemically subdue potential food sources or things that threaten it. In the case of the pholcid spiders, which do have venom, they have very similar fang structure and size to brown-recluse spiders, who are perfectly capable of having their fangs penetrate deep enough to do serious damage to humans. However, before 2004, there were no known records of bites from the pholcid spiders to humans. This may be because, when they do bite, nothing particularly bad happens. Or, it may be because they simply aren’t very aggressive or because their muscles used with their fangs aren’t as strong as the very similarly fanged brown-recluse spider. In any event, the myth that their fangs are too small to penetrate sufficiently to deliver venom, simply isn’t true and to date, there is no scientific basis for the notion that their venom is particularly harmful to humans. Case in point, in 2004, the show Myth Busters had one of their people attempt to get bit by one of these spiders and supposedly they were successful. Rather than die from the bite, the person bitten reported simply feeling a very brief and mild burning sensation which disappeared quickly. Further, research done by Alan Van Dyke has shown that the pholcid venom doesn’t even negatively affect insects all that much either, so is considered to be very mild. So the two myths surrounding that one, that they can’t bite humans due to mouth/fang size and that their venom is particularly harmful, simply aren’t true. For the other variety of “daddy long legs”, opilionids, they actually have no venom, as stated before, nor a method to deliver that venom, like fangs, even if they possessed the venom in the first place. They live off decomposing vegetation and animal matter, primarily. They also aren’t actually spiders, which would of course make the statement “most poisonous spider” even more nonsensical. Pholcids are the type of daddy long legs that you might see in your basement or bathroom or other damp places. They are also called “cellar spiders”, for this reason. Interestingly, the pholcids webs have no adhesive properties, unlike a lot of other types of spider webs. To catch prey, they instead will build their webs in an irregular pattern which attempts to trap the insect in between the layers until the spider can envelope the insect with its web directly and then bite it, injecting its venom. Rather than biting larger prey, the pholcids first line of defense is actually to shake itself rapidly on its web. This makes it difficult for most predators to focus on the spider and, with the irregular structure of the web, can even make it difficult for many predators to tell exactly where the spider is on the web. Their second line of defense, in terms of their typical behavior, is simply to leave if the vibrating doesn’t get rid of the predator. This very unaggressive behavior may be largely why they never seem to bite humans. For those wondering the difference between poisonous and venomous, poisonous animals give off their toxins when touched or eaten. The poison is then absorbed or sometimes inhaled by the assailant. Venomous animals transmit the toxins directly by injecting them into their victims. Are Daddy Long Legs the Most Poisonous Spider? @douglas: It depends on where you’re from. People from different regions call different things “daddy long legs”. You are correct though that in some places daddy long legs doesn’t refer to a spider. too* unless I am reading that wrong. @Mariionette: Thanks for catching that. Fixed! As for the other and it’s 30sec mildly burning sensation venom… SPIDER! KILL IT! KILL IT WITH FIRE!